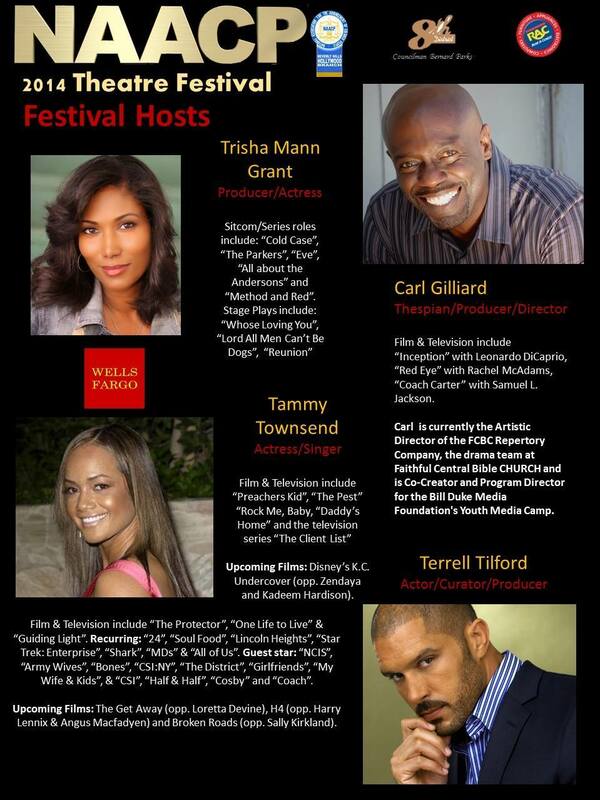 TEAM TILFORD: Terrell co-hosts the 2014 NAACP Theatre Festival this Sunday! Join Terrell Tilford & Trisha Mann Gilbert this coming Sunday, 14 September 2014, as they host the 2014 NAACP Theatre Festival. This is a two-day event, occurring Saturday & Sunday, 12-4pm. Carl Gilliard & Tammy Townsend will host Saturday’s event. The 10-minute plays happens both days with Sunday’s event featuring a multitude of talented artists including: Roger Guenveur Smith, T’Keyah Crystal Keymah, Ted Lange, Alex Morris, Saundra McClain & Levy Lee Simon.